This was a little talk that my good friend Simon Egan and myself delivered at Blooloop Live – the best Industry event for themed attractions across the world. Whilst there is a bit of messing about in it, there’s lots of sensible points hidden in there too. 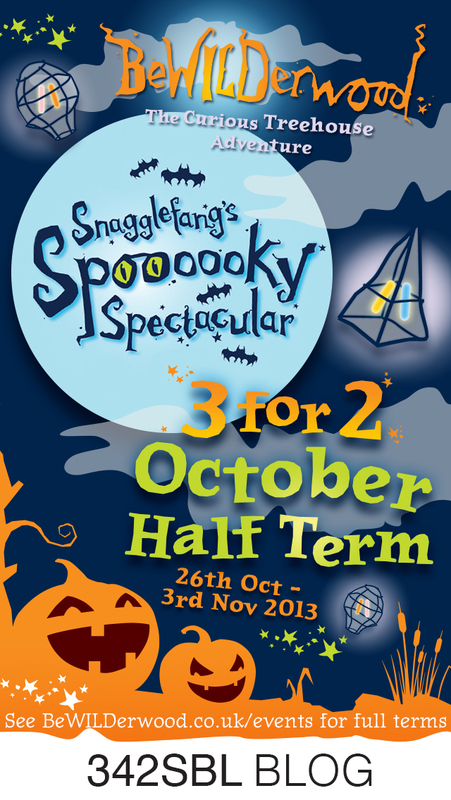 It’s unusual to see an offer like this from BeWILDerwood, but it’s a good one with a 3 for 2 during the NORFOLK October half-term. Just download it and then bring it with you to get in cheaper. Just out of interest, it’s normally quieter on Saturdays as that’s the day that people are travelling to and from Norfolk. I was over at BeWILDerwood yesterday on the last Friday of half term and their last day where they were expecting a great crowd before they close for the season on Sunday. There were 1600 people in and an amazing atmosphere. The night before BeWILDerwood had been awarded the title of the best large attraction in the East of England, beating Duxford Air Museum and Woburn Safari Park at the regional Enjoy England for Excellence Awards. Having spent time there when it was that busy. I’m not surprised. The children were having a great time, swinging and whooping in the woods and the Twiggle Team had put on free lantern making sessions for all, leading to a giant lantern parade through the woods as the light fell. It was a magical procession, with well over 500 people parading happily through a totally unlit woods on their way home. They were lead by a giant lantern bat called Snagglefang. It seems so simple to get children to play again and for their parents to play with them, yet many get it so wrong. BeWILDerwood proves it can be done beautifully and elegantly and without breaking the bank. Seven of us ate and drank at lunch for £32 and we ate well, with the biggest hot dog I have ever seen, made from a beautifully tasty award winning Norfolk sausage. It was as good as if you’d barbecued it yourself, having made the effort to get lovely ingredients first. The slides were brilliant too and you can see from the face of young Charlie here, quite how much fun he’s having. I know I’m biased because we’ve been involved in BeWILDerwood from the outset, but to see the way that my kids played and our friends kids played and how they all slept on the way home, it was an absolutely brilliant day out for very many families. I love this place, my kids love this place and my friends all love this place and I’m not surprised it’s been recognised as the best in the east! Bring on the new season. And how cool does it look at night? Some of you may have seen this before, but I had to remove it because it had the wrong music on it and I was in danger of breaching someone else’s copyright. If you want to take your kids there, it is officially the best Children’s adventure park in the world! 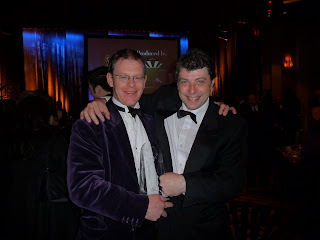 As promised, here are the pictures of Tom and Simon from BeWILDerwood in their finest finery collecting the THEA Award in the Disney hotel in Los Angeles. 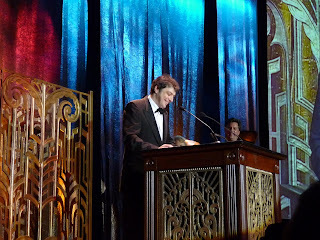 Pictured during the speech and then looking very relieved afterwards, Tom was rather excited to get the chance to address the whole group with a very weepy acceptance speech, just like they do at the real Oscars.” I have to thank my Mum, my Dad, my Wife, Son and daughter for making me the man that I am………. Anyway, a good night was had by all and it is one hell of an honour to speak to EVERYONE in the industry. Enjoy the pics that are shown in order. Hot on the heels of Kate Winslet and Slumdog Millionaire’s success in Hollywood, the Brits have done it again. Purple Circle, the Nottingham-based branding and graphic design studio has just returned from Los Angeles with the themed entertainment world’s equivalent of the Oscars – a THEA. THEA is an annual award ceremony for the Californian-based Themed Entertainment Association (TEA), celebrating the very best of themed entertainment throughout the world. 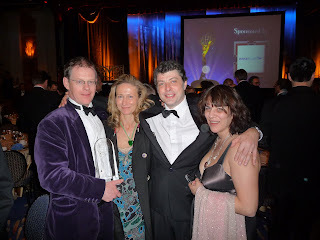 The award is for Purple Circle’s work with BeWILDerwood – the children’s woodland adventure park in Hoveton, Norfolk. A truly worldwide organisation, all of the big players and many famous names in theme parks and live entertainment are members of TEA – Disney and Universal Studios to name but two. 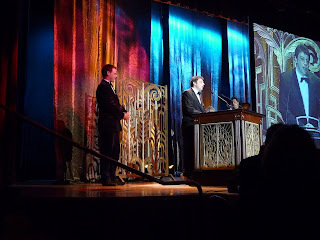 This year’s award ceremony took place on 7th March at the Disneyland Hotel in Los Angeles, California. Purple Circle’s BeWILDerwood entry was the only British theme park receiving an accolade, and was one of only two European attractions recognised. Other winners for 2009 included the teams behind the opening ceremony for the Beijing Olympics and The Simpsons Ride at Universal Studios Hollywood. Purple Circle has worked with BeWILDerwood since the park’s inception, creating not only the branding but also the theming and the tone for the entire attraction. The park has been a runaway success since it first opened its gates in May 2007; in 2008 it attracted over 140,000 visitors, a figure more than double the number projected. Purple Circle operates as an integral part of the BeWILDerwood team, partnering them in all of their creative efforts, including the design of much of the merchandise that is sold through the park and online. This includes the popular children’s books ‘A Boggle at BeWILDerwood’ and ‘BeWILDerbats’ by Tom Bofled, the founder of BeWILDerwood. John continued “Branding is far more than simply sticking logos on things; rather, it is about an organisation – however big or small – setting a tone for its entire communications and ensuring that the core values of the company pervade every aspect of the business. If you can do this, it doesn’t matter whether you are speaking to your team or to your customers, you can create a brilliant brand – even with a swamp to work with.